Maybe you’re a lover of cookies, or maybe it’s brownies. Personally, I love both. But never in my wildest dreams, did I think about combining the two into the ultimate creation: a brownie cookie! No joke. 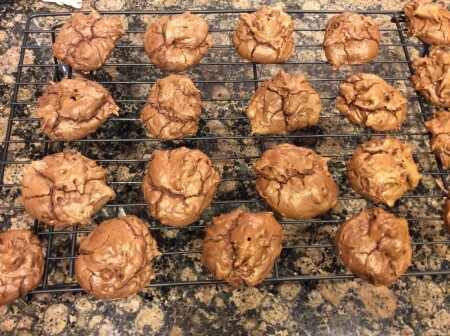 The way this came about: my boyfriend came home from work one day raving about the brownie cookies one of the ladies at the office had given him and asking me if I could recreate the magic. 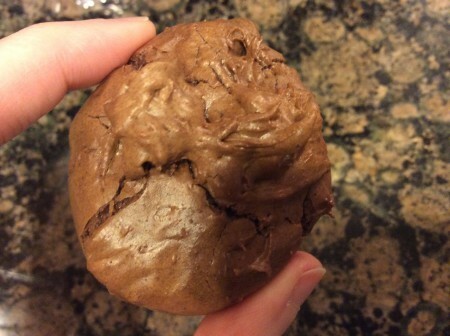 Not one to be outdone, I took on the challenge and began doing my research on how to make this chewy, fudgy, cookie, brownie, Frankenstein of yumminess. Obviously I was a little behind the curve as lots of people have already taken to the mixing bowl and oven with their own special cookie brownie creations. Alrighty then. After lots of perusing and note taking, I got into the kitchen and got busy, and what emerged is a darn good brownie cookie dessert if you ask me. They’re dense and fudgy like a brownie, chewy and chocolate chip-filled like a cookie, and remarkably easy to make. I promise that if you bring a plate of these to Thanksgiving dinner, there won’t be any left by the time you leave. They’re addictively good. Roughly chop unsweetened baking chocolate squares and butter. Combine butter, baking chocolate and 3/4 c. of mini, semi sweet chocolate morsels in a large saucepan. Melt together over low heat, stirring constantly until all combined. Once melted, remove from heat to cool slightly. Combine flour, baking powder and salt in a small mixing bowl and set aside. Mix eggs, sugar and vanilla extract in a larger bowl with an electric mixer at medium speed. Add the flour mixture a little at a time to the egg and sugar mixture beating well. Finally, add the semi-cooled melted chocolate to the batter until all combined together. 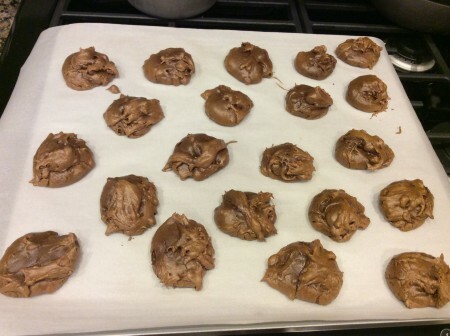 Fold in remaining chocolate morsels. Drop dough by about 2 tablespoonfuls 1 inch apart on parchment paper-lined baking sheets. Bake brownie cookies at 350 degrees for 15 minutes until a toothpick inserted in center comes out clean. Cool for two minutes on baking sheet, then remove to wire racks to cool completely. Enjoy right now or store for up to 10 days in an airtight container on the counter. The brownie cookies fresh from the oven on their baking sheet. The brownie cookies cooling on a wire rack before being devoured. That’s a little cookie of pure heaven right there. And cracked on top just like brownie crust. Perfection!